Maps of Forbidden Remembrance is a theatre/visual arts collaborative performance piece by Dah Teatar, of Belgrade, Yugoslavia; and 7 Stages, of Atlanta, Georgia. The main textual source for the piece is Constancia, a novella by Mexican writer Carlos Fuentes. 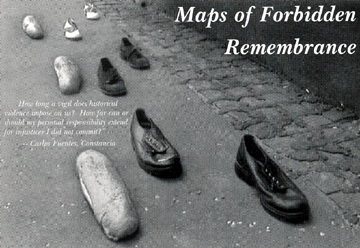 In Maps of Forbidden Remembrance, a man is haunted by four women. It's unclear if these are four different women, from different lands and time periods, with different histories, or if they are ghosts. Are they one woman or are they four? The story of the performance occurs mostly in Savannah, Georgia; some scenes are set in Seville and Russia; some scenes exist only in memory. International and American cultural distinctions are highlighted, revealing the connections between progress, artistic responsibility and the sources of strength in troubled times. The musical score of the piece is created by the a capella voices of the actors, singing songs from Yugoslavia, North America and Latin America. If one is forced to leave one's country, what kind of life continues in exile? Is it possible for an artist to create outside his/her native country? How do our memories alter the facts of our lives? What responsibility do we carry for our ancestors' actions? The process for creating the piece was an approach developed by Dah Teatar which involved personal storytelling by the performers during workshops, and matching the material of the Fuentes story with the storytellers. Dah Teatar members Dijana Milosevic, Maja Mitic, Sanja Krsmanovic-Tasic and Nesa Paripovic came together with 7 Stages' Del Hamilton and Faye Allen and ArtSpot's Kathy Randels in Atlanta in April and May 2001 to work on this piece, which premiered at 7 Stages on May 15, 2001 and was performed in Belgrade and Novi Sad, Yugoslavia in June 2001 and in New Orleans, LA and Farmville, VA in the fall of 2002.